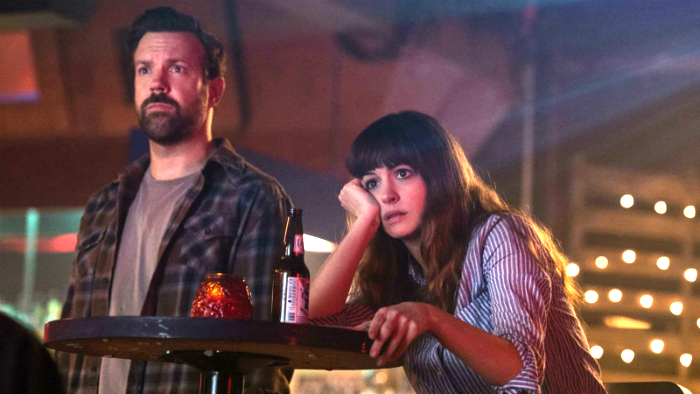 In Colossal, Gloria has been out of work for a while and spends her time partying instead of finding a new job. Her boyfriend kicks her out and she is forced to leave New York City and go back to her hometown to figure out what to do next. While there, she realizes she is somehow connected to a huge creature that keeps attacking Seoul, South Korea. Colossal is very weird, but in a very entertaining way. I think the movie would be more fun the less you know about it. The trailer gives some of it away, but that made me want to watch it more. There is still more to the story than what is given away in the trailer. Anne Hathaway is charming, even when she wakes up from a drunken stupor with no recollection of what happened the night before. Jason Sudekis is remarkable since he starts off playing a sweet guy who had a crush on Gloria when they were kids, but then his character turns a bit dark as the movie goes on. He has more of an acting range than I previously gave me credit. Dan Stevens isn’t given much to do. The relationship with his character and Gloria isn’t set up much so when he shows back up later, it isn’t like you are rooting for them to get back together or not since there isn’t much to it. Some odd choices were made in the movie that didn’t make much sense, which is saying something since so much of the movie doesn’t make sense on purpose. For example, she has no money and it is established that her friends have been giving her rides and paying for her drinks when she’s in the city but somehow she has money to take a taxi back to her hometown (not sure where that is, guessing upstate New York, but it still had to be expensive). Also, when the area of Seoul keeps getting attacked by a monster, they don’t evacuate it. It happens at the same time and place every day. Why do people go running every time it shows up? Why are they still there? Beyond those random bits, I recommend this movie if you want to watch something weird and entertaining.